The website Firebox (tagline: “The Coolest Things You Can Buy”) is selling the world’s first WiFi kettle. 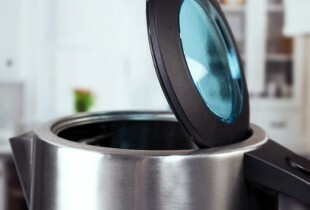 Called the iKettle, this nifty gadget responds to commands from your smart phone. So how exactly do you use the kettle? From anywhere in your house, set an alarm. 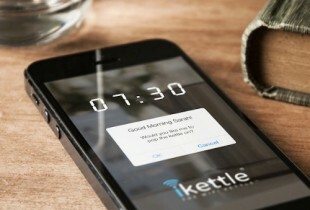 When the alarm wakes you up in the morning, the iKettle will send the message, “Good Morning! Would you like me to pop the kettle on? Yes / No.” Essentially, your kettle has just become friendlier and more useful than your significant other. When your water boils, you will receive a second notification on your phone. You can even tell the iKettle to keep your water hot while you drag yourself out of bed and into the shower. The kettle has settings for both Green Tea (80°) and Coffee (95°). 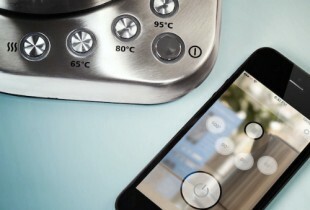 Firebox worked to streamline the iKettle’s design as much as possible. Their website states, “Just because the iKettle is packed full of incredible technology, this doesn’t mean it has to look like something out of Wallace and Gromit. With its clean stainless steel design, LED Backlit control panel, soft-touch rubber handle and functional filtered spout it’s very much a smart and refined addition to your kitchen.” They also write, “Please note: May cause you to fire your butler/maid and throw away your alarm clock.” It’s okay. We didn’t like our butlers that much anyway. The kettle holds 1.8 liters, features a removable filter, and has auto-shutoff protection. It is available from Firebox for $159.59. Watch the promo video here. Then click through the gallery to see your new best friend, the iKettle.